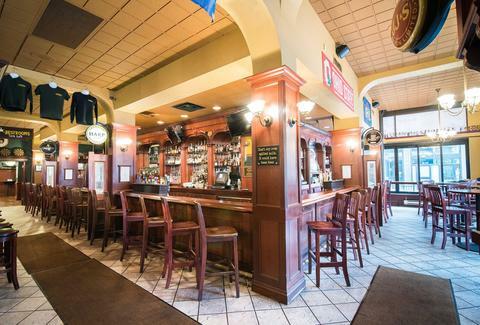 Call it luck, but Cleveland is rich in great Irish bars. From old-school dives to rowdy nights of live Irish music, it's where you don't have to wear green to drink the night away. While everyone claims to be a little Irish on St. Patrick's Day, all you have to do at these watering holes is pour yourself another Guinness. There may be no rolling hills in Cleveland proper, but there is plenty of beer. So hoist a pint to some of Cleveland's best with our guide to the Irish pubs that will be more than happy to top off your whiskey. 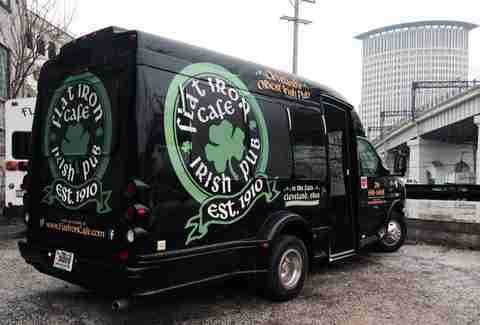 Ask anyone parading through the Downtown streets on St. Paddy's Day which Irish bar they'll be celebrating at, and they're likely to say Flannery's. This party destination wears its Irish pride year-round. At the heart of East 4th St's foodie scene, this wood-paneled pub is spacious and laid-back, with huge windows that offer a glimpse of the bustling brick road outside. There are plenty of Irish-inspired snacks on hand, with many more slated for this year. In the sea of bars that is Lakewood (have we mentioned how much we love Lakewood? ), Merry Arts Pub & Grill has stood the test of time -- it's the oldest watering hole in the entire city. It's also known for great tacos. They may not be Irish, but is anyone really complaining? There's no greater Irish love story in Cleveland than the one behind PJ McIntyre's. Owner Patrick Campbell and his wife met at auditions for bare-chested Irish dancing sensation Michael Flatley’s Lord of the Dance and performed together in Vegas; classic bad boy meets good girl. Fast-forward, and Campbell now runs the gem of West Park. Its Stack Stone fireplace is like the ones used to heat homes in Ireland. And driving by the Kamm's Corners strip, you would never know there's a dance studio a floor above sending its students to the world championships. This quaint respite is classically Irish. With a welcoming bar and authentic fare, including shepherd's pie, Greenisland is the right place for a date night, with Irish music playing in the background. This is a neighborhood bar through and through, and a West Side hidden gem, so expect to see a sea of regulars being called by name. 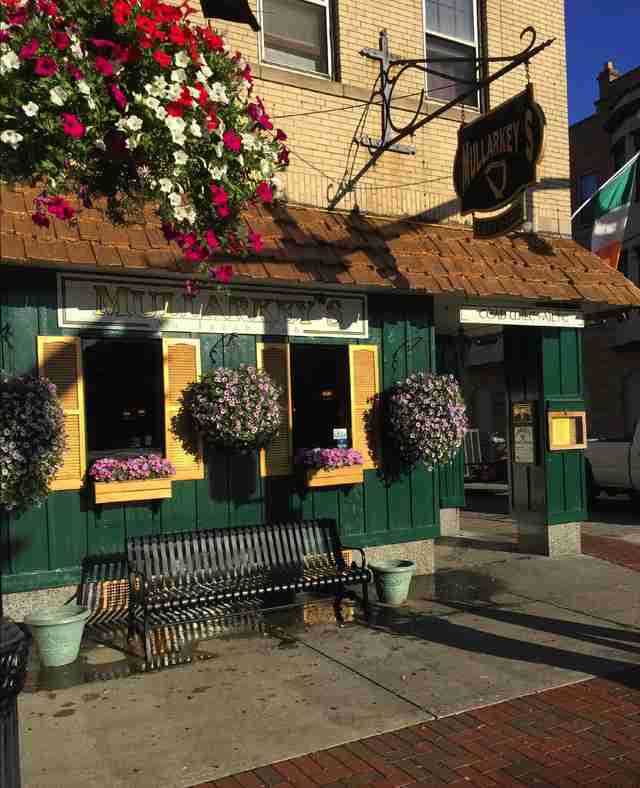 It could be the view, the patio, or the six different kinds of boxty that make The Harp an Irish favorite. Irish coffees, toddies, and brews are plentiful here, and the menu has classic hearty favorites like shepherd's pie and colcannon. It may be cozy, but The Harp also boasts a spirited crowd. That's all helped along, in part, by the regular live Irish music. This Irish hideaway is the gem of the Cedar Lee arts district. 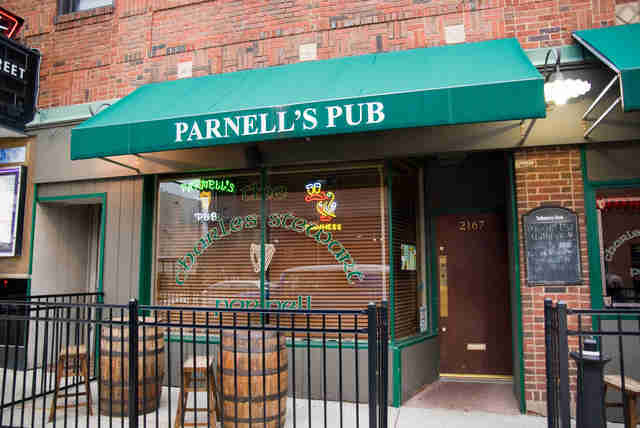 Snugly tucked away in the strip, Parnell's is small, narrow, and low-lit. It's the kind of intimate place where everyone knows each other's name because they're in such tight quarters and have no other option. While it has its share of regulars, Parnell's is a perfect place to duck into before or after a show at the arthouse cinema, Cedar Lee Theatre, right next door. Owner John Sullivan blocks out two weeks every year to travel to Ireland with friends in the Irish band The New Barleycorn. It’s uncertain whether he's there for tipsy sing-alongs to "Will Ye Go Lassie, Go?" and "The Hills of Connemara," or to soak in the culture, but we're going to guess that both bring a healthy dose of authenticity back to the rolling hills of... Cleveland. When you have Guinness Gold-certified status bragging rights, you have a lot to live up to. Luckily, this nook has mastered more than the perfect stout pour. It's a departure from the rowdy Dublin-style bars, instead taking its cues from homey rural pubs. But it also can keep up with the high-octane Willoughby weekend scene. Expect loud, live Irish music. If ever you could call a bar in the very middle of Downtown off the beaten path, it would be this hidden-in-plain-sight dive. A straightforward place serving strong drinks, this no-nonsense bar eschews the flashy foodie world of its surroundings in favor of the traditional. There's nothing bougie here, just classic pints in compact quarters. We're not condoning mixing pints of Guinness with dart-throwing, but we're not not telling you that this is the place to do it. Now into its third decade of slinging Guinness (one of the first bars in Cleveland to do so), this wall-to-wall-green pub is casual and easygoing. If the iconic shamrock on the sign outside doesn't give you an idea of what you're in for, the Irish music blaring from the analog jukebox surely will. Knock one back for the city's oldest Irish pub, where the antique exposed brick transports you to the old-fashioned pubs of Ireland. It's hard not to feel Irish when the walls and interior are decked out in green everything. But don't think The Flat Iron is stuck in the past: The shepherd's pie is made with fresh, grass-fed lamb straight from the historic West Side Market. If you need something to soak up the Guinness, portions are heaping. Nikki Delamotte is a Cleveland-based freelancer who has marched in Cleveland’s St. Patrick’s Day Parade, which makes her at least honorary Irish. Follow her pub-filled adventures on Twitter @nikkidelamotte.